I am currently Head of Gunsmithing for Douglas County Firearms and have one subordinate who reports exclusively to me. We run a full service gunsmithing shop with expertise in customizing firearms, restoring old and neglected firearms, and repairing broken ones, along with the usual detail cleanings and diagnosing problems shooters have with their guns at the facility’s indoor range. The gunsmithing shop normally tends to around 30-50 guns at a time, many of which are waiting for replacement parts to arrive. I am solely responsible for this department of DCF Guns including all financial transactions, equipment and supplies. An ordinary day at Douglas County Firearms has me doing trigger jobs on 1911s, customizing AR-15 rifles, and restoring 100 year old pump shotguns. I am often called upon to fix known defects with firearms, in effect making them better than they were new in the box. For example I have recently discovered and subsequently solved the root cause of infamous trigger reset problems in the Ruger SR series guns and the SCCY CPX-1. It is not a boast to say that I know more than Ruger and SCCY about why these pistols are having problems. AK-74SU Krinkov I built from an Armory USA receiver and parts from Bulgaria. This is an NFA registered Short Barreled Rifle. From 2005 to 2010 I was part owner of Missouri Custom Armament, LLC, a class II manufacturer of small arms and Special Occupational Taxpayer holder. These federal licenses gave this side business the legal authority to manufacture firearms, including firearms and items covered by the 1934 National Firearms Act such as machine guns and silencers (suppressors). 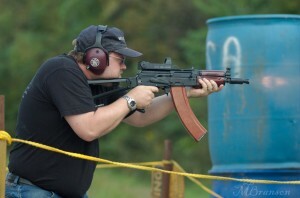 Missouri Custom Armament built hundreds of custom rifles based on the proven Kalashnikov pattern, and took on custom gunsmithing projects of other sorts as well. I personally spent a lot of time building and customizing AK-47/74, AR-15, and 1911 pattern firearms. MCA was under capitalized and never truly profitable when money gained was compared honestly to time spent. Despite building some beautifully crafted firearms and very effective silencers, by the year 2010 Kalashnikov parts had become too rare and expensive to sustain a profitable business model, and we voluntarily surrendered our license that year. I continued to teach pistol and carbine classes as an instructor with Gun Control International and DVC Training. I also taught the Missouri Concealed Carry Endorsement Class under the auspices of Branson Legal Services, LLC from 2006 until leaving Missouri for Texas in 2011. Federally licensed manufacturer of all types of small arms excepting “Destructive Devices”. Using a purpose built machine shop located first in Holden, Missouri and then in Blairstown, Missouri, along with four other business partners, constructed hundreds of custom rifles, pistols and shotguns for customers across the nation. Custom assault rifle “Kermit the Frog” was photographed and featured in Book of the AK47 Two by Patrick Sweeney. Designed, developed and manufactured prototype silencers capable of reducing the blast from an AR15 rifle to a sound level approximating the report of a .22 pistol. Built four custom machineguns designed to fire blank ammunition, which were then used to educate Army and Marine ROTC students in realistic field training exercises. Provided special orders, repair services, and armory support for local law enforcement agencies “at cost” with no profit to ourselves. Since 2006, have instructed hundreds of students through my Missouri Concealed Carry Endorsement Class, an 8 hour class exceeding all state law requirements for graduates to obtain the knowledge and proficiency necessary to safely and legally carry a concealed firearm on their person in the state of Missouri. 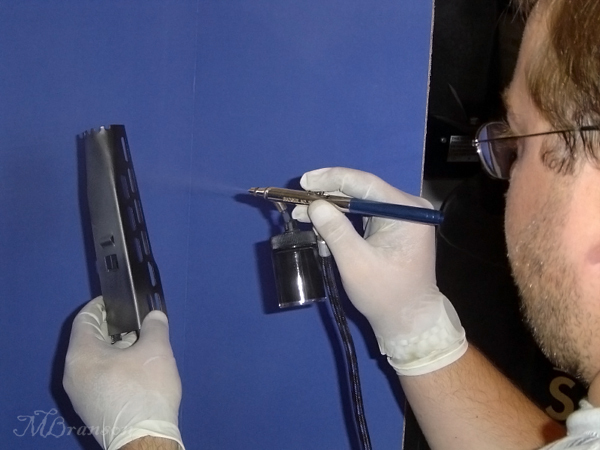 Applying Norrell’s Moly Resin finish to a Hungarian AMD-65 handguard at Missouri Custom Armament. © 2010 Mike Branson Consulting. All Rights Reserved. Greyzed Theme created by The Forge Web Creations. Powered by WordPress.